Now I know he’s just talking about his job and family, but I tend to reflect deeply without much provocation. To me, the meaning and definition of words is an important matter. The use of “work” and “life” here in this context got me thinking. Our culture believes that work is the opposite of play. There’s work and there’s life. By these definitions, life must then be everything you do or experience outside work. Work is supposed to be hard and you aren’t supposed to like it. Where do these definitions come from? They come from starting with money. From a young age, we’re encouraged to start with the money. How do we pick a career? This starting question breeds a certain mentality about work. You choose your work according to its money-making abilities. Whether you like it or not is moot point. If you’re lucky, you’ll learn to like it but if not, tough luck. “Nobody likes their work,” we’re told. The job landscape is no longer what it was, a degree no longer guarantees a job, and they have no marketable skills. They must also start their lives with massive, crippling debt. For the few that do make it and get a job that pays well, they very often discover they hate what they do. This is the depressing phenomenon known as Golden Handcuffs (Related: e086 Why You Should Quit Your Job). How do you get to a place where work is not synonymous with monotony? How can you actually enjoy your work? Is it possible to be supported by something you love to do? How do you prevent that thing from turning into a J-O-B? What other way is there in the real world other than starting with money? 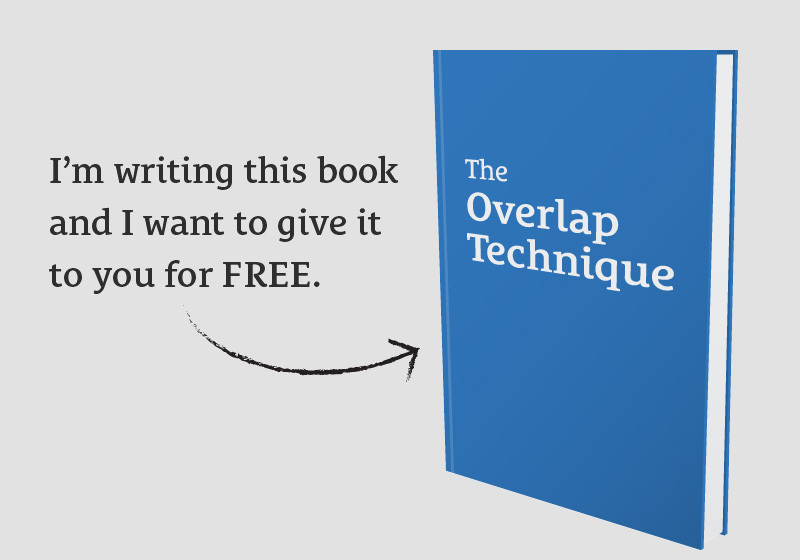 I’m in the process of writing a book called The Overlap Technique. It’s a practical, step-by-guide on how to find your passion, become an expert, and make more money than your day job before you even quit. Sounds like a tall order, right? I’m up to the challenge. I started writing this book earlier this year and ended up having to put the writing on hold. My business was and is continuing to grow rapidly, and the responsibilities and workload continue to increase. It’s been an insanely busy year, and things keep get crazier (in the best possible way). The reality though, is I need help. Within the next 2 months, I’m bringing on 2 employees. This will significantly lighten my load and enable me to complete the book among many other things. The good news is, the time away from the first 20,000 words I’d already written (about half of my original goal) has given me some significant clarity. I’m going to be rewriting the book entirely and I know it’s going to be much stronger for it. Since I started writing the book, I’ve gotten hundreds of emails in response to my question of “What is the hardest thing that is keeping you from pursuing your passion?” This is helping me shape the book into a direct response to your greatest challenges. What I’m about to do is share with you my philosophy in a nutshell. What follows is essentially the cliff-notes version of The Overlap Technique. Obviously it won’t do full justice to my message (hence why I’m writing a book!) but I hope it gives you a bit of insight and something to look forward to. We have many things we say we love to do, but often it’s only the idea of them that we love. Once we actually apply ourselves and decide to dedicate several hours a day to pursuing something, we often find that we don’t actually enjoy the act of doing it. The idea of being a best-selling author vs. The act of waking up early and writing every day. The idea of being an accomplished musician vs. The act of practicing scales on the piano over and over. Get a day job that is in an industry unrelated to what you love to do. I’m going to abbreviate this section since I’ve covered it at length elsewhere (Related: e102 Why It May Be the Wrong Time to Pursue Your Passion). In short: The day job needs to cover 100% of your bills. Not part of your bills. 100% of your bills. See above link for more details. The day job is your foundation. The passion is your dream house and you’re building it on the foundation of the day job—that needs to be stable. It needs to completely be the foundation and the support of this house that you’re building. If you’re building it on half of a foundation, it’s just going to crumple. This is a prerequisite for what follows. Find what you love by actually doing it. This is going to take exploration. It’s going to take doing. You’re going to have to apply yourself, and you’re going to find a lot of things that you thought you loved but you don’t actually love the act of doing (Related: e101 How to Find Your Passion). This thing isn’t your day job yet. This is just what you’re pursuing in your nights and weekend. Yes, you have responsibilities. Yes, you might even have kids. No one said it was easy. I’m saying it takes sacrifice. It takes saying “No.” It means not doing things. What will you have to say “no” to? What are you not doing to make something more important possible? Those who are doing things you admire aren’t blessed with 25 hours in a day. They sacrifice. They make time. I chose not to read the stack of books I bought and have yet to open. I chose not to play Xbox. I chose not to watch several videos of talks I have saved in my YouTube watch later list. I chose not to respond to the mountain of emails in my inbox. I chose not to do a lettering piece I had in mind. I chose not to go through the list of articles I collected in Instapaper this past week. I’m burning with passion for this message I’m sharing with you right now. I had to say “no” to all of the above to write this. I had to say “no” to make this happen and get this message to you. All of this takes time. It takes focus. It takes perseverance. It takes sacrifice. No one is born knowing what they love to do. There are many 70-year-old people in this world that claim they don’t have a passion. They claim passion is a myth. They claim passion is only for some people. Passion is not something you wake up with. It’s something you uncover. It takes sweat and it takes doing. It’s a choice, and it’s saying “no” to 99 out of 100 things. Over and over again. Get good at what you love doing. After much dedicated application, you discover something that you thoroughly enjoy the act of doing. Good! Now you need to put in the time. Now you need to invest the hours. Now you need deliberate practice (Related: e051 Getting Better on Purpose with Deliberate Practice). This is not something that takes days or weeks. I’m talking years. We’re going for the long game here. Get good at what you love doing. This requires deliberately practicing the aspects of this trade that you are weak in. You can’t just show up and play piano pieces—you have to deliberately practice the scales that are contained within the piece you want to master. Just playing the piece itself is only going to haphazardly make you better. It’s like trying to imitate your favorite illustrator or artist by directly copying the final piece. Will you learn that way? Yes, some. But you will be weak in the fundamentals and your progress will be extremely slow. Don’t just copy their shadows, spend the time understanding and learning the fundamentals of lighting and how light casts different shadows. If you don’t understand the fundamentals, you can only copy the final results. You will not be able to recreate or fabricate quality, original work of your own from scratch. Make money with the thing that you A: Love doing, and B: Are extremely good at. This leads us to the method I call The Trifecta (detailed below). The Trifecta is my method for making a living at anything you love to do. That last bolded part is important—that’s why I emphasize it. This method enables you to make a living at anything you love to do. We talked about the resulting problems with that approach earlier. We have a lot of people who started with the money question, only to later find out that there are no guarantees. We also have a lot of people who make good money and are miserable. When you start with money, you give it the power to dictate what you do with your life. I won’t detail each of the three methods here since I went into so much depth in the episodes linked above, but this is what my book with further divulge. I’m getting excited just talking about it right now. Did I mention I’m giving away the book for free? I hope you’re excited too. 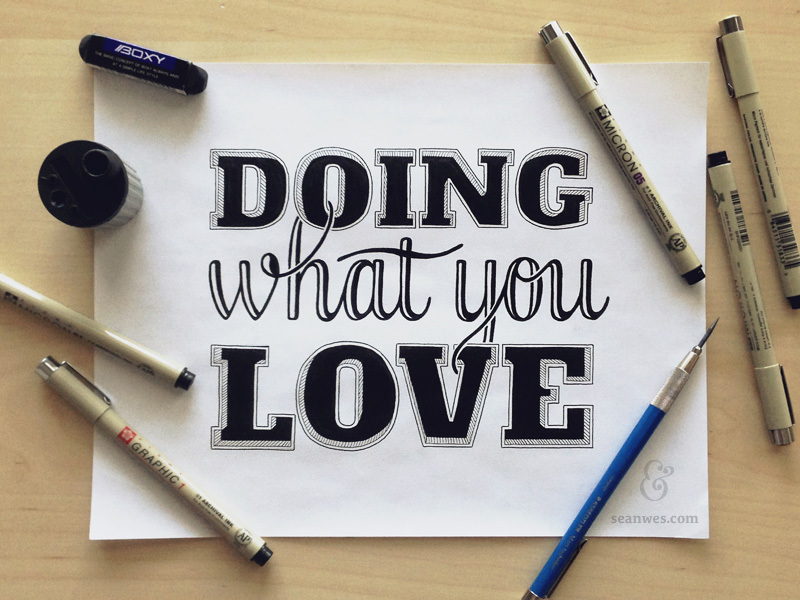 The world is over-saturated with empty “do what you love” and “follow your passion” messages. 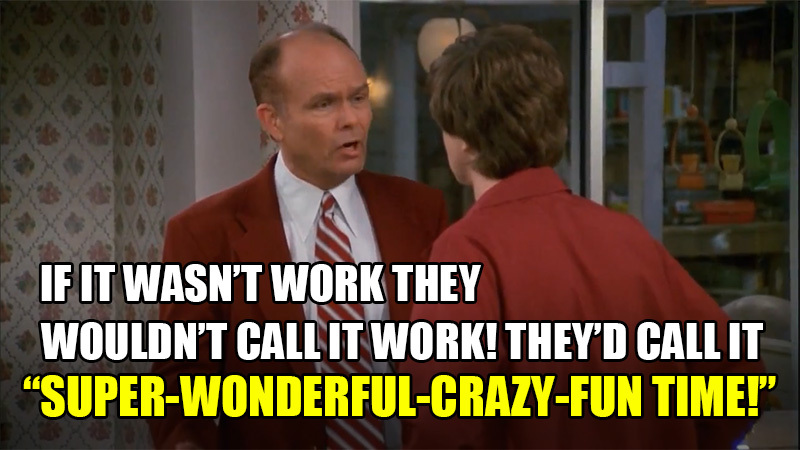 Mike’s right about one thing: it’s not that simple. You can’t simply “follow your passion” and know that everything will work out. It’s flippant, if not merely empty, advice. “Follow your passion” is not enough. Where should I focus my marketing? How much of my resources should I allocate to marketing? What ratio of funds should I invest in marketing compared to what I invest in making my products better? Similarly, with the “follow your passion” message, we are left wanting. It’s not enough. It’s not that simple. The word passion is overused, but it’s not broken. Is the “follow your passion and everything will work out” message bad advice? Yes. Absolutely. All of this is within the context of having a day job already. That’s the protecting part. Your day job is the protection that keeps you from compromising your passion right away to pay bills. No one is doing it in this order. People aren’t overlapping. Notice the monetize part is at the end. Everyone wants to do that part first without any foundation or support. They’re putting themselves in place of having to pick the “right thing” and monetize it too quickly so they can make up the difference in their income. This is the quickest way to kill the passion, and it’s what results in people who have jaded views of the word passion. I aim to breathe life back to this word. I’m not here to give you the fluffy “Do what you love” and empty “follow your passion” advice. I’m here to give you the down-to-earth practicalities of how you can actually enjoy what you do and support yourself doing it. You are the only person who lives 100% of your life. This isn’t a game. This is it. This is life. You have ONE existence. It is an utter shame to let what someone else thinks limit you. I believe your life matters, and I believe you matter. Everyone else is going to have priorities for you, and how you should live your life, and how you should spend your money. They will impose their priorities on you. Do you want to disappoint those people or do you want to disappoint the future version of yourself? It’s not all rainbows and butterflies, but it is possible to start with your passion and sustain it if done in the right order: find, protect, invest, monetize. I’m not going to let the jaded messages of this world keep me from enabling you to do it.